We’ve spent considerable time with Rawlings 5150 line of bats. It is as familiar in the industry as any bat has ever been. In some sense it defines the traditional single piece aluminum bat. No frills, no gimmicks, just a real bat from a real company that works year in and year out. We aren’t the only ones to have information about the 5150. Other places, in particular those who sell bats, usually have a boiler plate write up on the specs of a bat. Many of those we reference to make sure we are seeing what we should be. Here are some more references for the 2019 Rawlings 5150 review. This year’s addition of a 29 inch on the BBCOR side expands its reach even further. New BBCOR players as well as seasoned NCAA Division 1 players have serious success with the 5150. We recommend the bat to the budget buyer looking for as much stiffness as possible in a mid-range swing weight bat. There are a few things to consider and we share that in our 2019 5150 Rawlings Review. This is a straight forward single piece aluminum with a stiff feel. Hit well and it can destroy a ball. They haven’t changed much about this bat in the last 4 years. That is not a bad thing. The 5150 from Rawlings in BBCOR in a mainstay int he industry. It is the single piece aluminum that keeps on giving and several college players love to swing it. It is a hitter’s bat. No frills, just drills. Like the USSSA, the drop 5 in a USA 5150 is a real ball killer. If you can swing that heavy a bat check it out. The drop 10 struggles with some hand sting and to the drop 11 isn’t our favorite. We couldn’t find anyone who loved the drop 11. It just didn’t pack enough punch to be taken seriously. However, if bat speed is your issue then the drop 10 or 11 might make some sense. They are light and would do well against slower pitch speed and a kid just figuring it out. The USSSA comes in a drop 10 and a drop 5. Most who can swing the drop 5 effectively love it. It packs a serious punch and feels like a cannon. If you are in the drop 5 world and are a great hitter check this one closely. The drop 10 lacks in that it will be up your hands. If your an elite player looking for a drop 10 its likely you won’t like this bat very much. But, the casual player looking for an entry level performance bat with a good name might take a shot on it. The 2019 5150 uses a lighter end cap that allows for a bigger barrel profile than the 2018 version. As well, the handle is thinner when compared directly to the 2018 version. The other considerable difference worth noting is the lack of a drop 5 USA Bat version in the 2019 set. If you need that then look for the 2018. As well, the addition of the 29-inch BBCOR in the 2019 version is a welcome addition for the smaller player looking for his entry level bat into the BBCOR bat market. Aside from those changes, which are noteworthy, the 5150 is the same, straight forward, single piece aluminum bat with a stiff feel and middle balance swing weight. 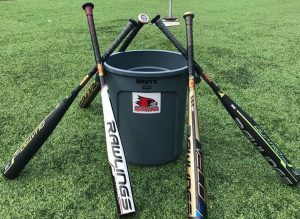 The 2018 Rawlings 5150 is a classically designed single piece aluminum bat with enough innovation to consider it a performance bat. In addition to the offerings we've come to expect from the Rawlings 5150, the 2016 iteration will also contain a hybrid bat in the senior league big barrel market. The most obvious comparison to the 2019 5150 is probably the 2019 Rawlings VELO (not pictured). The only differences between those two bats are the Velo uses a composite end cap to bring down the swing weight. Both of those two bats use the same barrel technology, grip and profile to produce a single piece bat. Outside of the Rawlings brand a similar version is the Omaha 519 (Pictured). However, as you’ll notice, the 519 is almost twice the price of the 5150 Rawlings. If you want a similarly priced bat check out something like the Rawlings BBCOR Threat for 2019 or Easton Speed. We’ve hit with every 2019 Omaha 519 from Slugger. This series of bats, not changed much over the course of several years, is just what the traditionalist ball player prefers. After a month of use with the BBCOR and USSSA versions of the CAT 8 we put together this 2019 CAT 8 Review. Easton starts their 2019 BBCOR bat offering with the new Alpha. As it has been since the dawn of time, the 2019 Rawlings 5150 is a single piece aluminum bat. The original name comes from the use of 5150 alloy to make the bat. This is a common alloy used in all types of baseball bats (and aircraft). Rawlings has their own spin on the makeup of the bat. The unique piece of Rawling’s 5150 is a barrel construction that is referred to as POP 2.0. This uses a tapered barrel design to give it a bigger sweet spot, lower its swing weight and deliver a bigger barrel. So far, the 2019 Rawlings is slated to release in a BBCOR drop 3 (of course) as well as a drop 10 USSSA and a drop 10 and 11 USA Bat. Likely the biggest news of the year (not really, but we think it a big deal) the 2019 5150 will come in a 29 inch BBCOR bat. And, get this, a 27 inch USA Version. Huge improvements, we think, in size offerings for those kid’s whose bodies just aren’t there yet. Considering that Little League is allowing BBCOR bats in their Junior and Senior leagues makes it a very viable option.